Early last week, I received an invitation from our friends at Alcatel Philippines for the official launch of their 2015 flagship smartphone, the OneTouch Flash 2, which will be held on the 22nd of September. For this local unveiling, Alcatel Philippines partnered with the number one one-stop online shopping site in the country, Lazada Philippines as the new phone will be available exclusively through this popular online channel. Alcatel One Touch designs, manufactures, and markets an expanding portfolio of mobile and internet products designed to be as unique as the people who use them. As one of the world's fastest growing smartphone manufacturers, Alcatel One Touch makes access to today's mobile lifestyle simple by offering feature-packed, easy-to-use devices equipped with the technology people need most at smart prices they can afford. 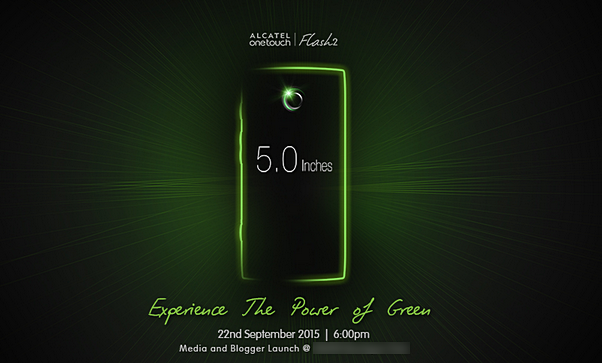 Alcatel Flash2, a new 5-inch smartphone of the French electronics company, will be launched via a global campaign entitled "The Power of Green". Alcatel hopes that this fresh release - with its new cutting-edge camera technology - would redefine the idea of mobile imaging especially among consumers who love taking pictures with their handsets. As of writing, we are still clueless about the design of the phone as well its complete technical specifications. Stay tuned for updates, TP Friends! In line with the handset's imminent launch in our country, Alcatel Philippines is currently holding a contest on its official Facebook page. Simply 'Flash' your profile picture and you might just be the lucky winner to be the first in your country to own the Alcatel Flash2! 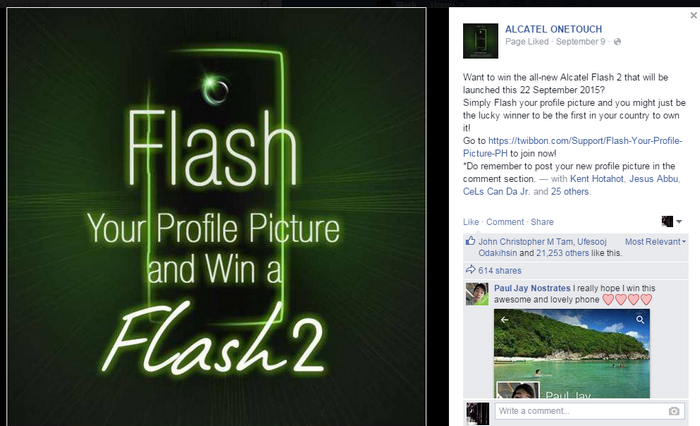 Go to Flash2 Twibbon site to join now and remember to post your new profile picture in the comment section of Alcatel's contest post on FB.